Now that you have a weeks worth of food and water, and know how to make a fire and cook without electricity, imagine what it will be like outside the walls of your home? In the throes of deperation for food and water,in an urban environment, we will see humans toss out all reason and humanity, and turn into animals. Animals that are ready to hunt and kill for food and water for themselves, and their family. - Become & stay physically fit (you don't have to look like a model, but in order to take care of yourself and your family, you at least have to be able to bend at the knees, walk, and *gasp* even run in some cases). - Become proficient with survival basics, such as farming. Not only reading about different tactics, but implementing them. Don't just read about growing your own vegetables, go in your backyard, or grow indoors and gain the experience for yourself. 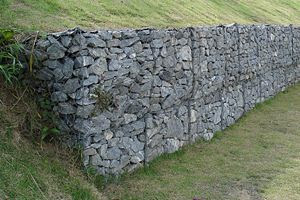 A gabion is just a fancy word for a retaining wall, or any man-made structure that is used for protection. They can be cages, cylinders, or boxes. They are filled with soil or sand that are used in civil engineering, road-building, and military applications. For erosion control caged riprap are used. For dams or foundation construction, cylindrical metal structures are used. In a military context, earth or sand-filled gabions are used to protect artillery crews. 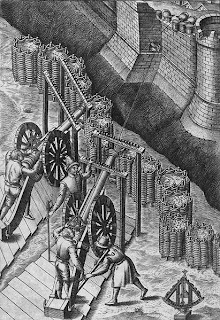 In medieval times, gabions were round cages with open tops and bottoms, made from wickerwork and filled with earth for use as military fortifications. These early military gabions were used to protect field artillery gunners. The wickerwork cylinders were light and could be carried relatively conveniently in the ammunition train, particularly if they were made in several diameters to fit one in another. At the site of use in the field, they could be stood on end, staked in position, and filled with soil to form an effective wall around the gun. The reason for bringing up a gabion is to show that we must Always Be Learning (ABL) about survival, and self-sufficiency. We at T.A.S. had never heard the word gabion. It's not that a gabion is so important, but it accentuates the fact that we must remain vigilant in understanding survival basics. There is always more to learn, and more importantly, understanding how to implement what you learn.